ALERT flood detection networks are becoming widely used throughout the United States and many other parts of the world. ALERT is a National Weather Service acronym which stands for "Automated Local Evaluation in Real-Time." This concept was developed in the late 1970's by the National Weather Service and was first implemented in the State of California. The evolution of micro-computers and the availability of ALERT equipment and software through private vendors have contributed to the affordability and popular appeal of ALERT Systems. The first ALERT network in the Urban Drainage and Flood Control District was installed in Boulder County in 1979 for the Boulder Creek drainage basin. This network, which is owned and operated by the Boulder County Sheriffs Department, has expanded since 1979 to now include a total of 41 rain gauges and 12 stream stage gauges covering the South Boulder Creek, Four Mile Canyon Creek, Left Hand Canyon/James Creek, and the St. Vrain drainage basins. In 1985, an ALERT network was installed for Lena Gulch in central Jefferson County, Colorado. This network, comprised of six rain and three stage gauges, was originally designed with future system expansion in mind. Due to its successful operation, expansion efforts began in 1987 and continued through this year. ALERT gauges have now been installed on six regional detention facilities constructed by the District to monitor both rainfall and stage. This "District Wide" network covers a large area from as far north as Louisville to as far south as Englewood Dam in Arapahoe County. Three additional gauging sites have recently been identified and are scheduled for installation in early 1989. Two additional basin flood detection networks have also been added to the system this year. The Ralston Creek project, affecting Arvada and Jefferson County, and the Westerly Creek project, affecting Aurora and Denver, have added an additional 23 sensors to the ALERT system. Plans for future system expansion in 1989 include additional rain and stage gauges for the Ralston network, a new flood detection network for the Toll Gate Creek basin in Aurora and the partial implementation to a flood detection network for Bear Creek in Jefferson County. As of November 1988, the District's ALERT system consisted of 26 rain gauges and 17 stage gauges. With the addition of the new flood detection networks next year and the continued expansion of the "District Wide" gauging network for flood control facilities, it has been estimated that a total of 48 rain gauges and 30 stage gauges will be on-line by mid-summer 1989. Plans are also being considered to integrate the Boulder County network with the District's ALERT system. By the end of 1989, real-time ALERT data may be centrally collected from more than 130 remote sensors. Three micro-computer base stations are currently in service. The primary base station is located with the contract meteorologist (Henz Kelly and Associates) and consists of a Compaq 386 processor with ALERT software, Okidata 393 printer, radio receiver, data decoder and backup power supply. The second base station, located at District offices, consists of an IBM PC-AT 286 processor and is configured for remote access. 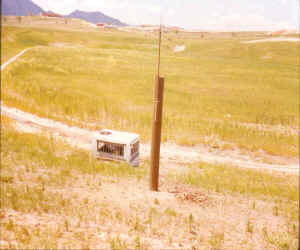 The third base station is located at The Consolidated Mutual Water Company and is dedicated as a back-up for the Lena Gulch Flood Detection Network. Additional base stations will be added in the near future. The National Weather Service is currently working on integrating the ALERT data with a new computer driven work station currently in operation at the Weather Service Forecast Office at Stapleton International Airport. The City of Aurora is also considering base station needs in conjunction with the Toll Gate Creek project scheduled for implementation in 1989. It is apparent that what was once a small network of gauges serving a 10-square mile watershed in central Jefferson County has quickly evolved into a much larger and sophisticated monitoring network. The real-time data generated by these ALERT networks provide the means for observing rainfall and stage fluctuations as events occur. By combining this information with other data sources (i.e. satellite imagery, weather radar, upper air soundings, other surface data, etc.) early flood warning capabilities are greatly enhanced. As the District's ALERT gauging system continued its expansion with new flood detection networks and warning plans coming on-line, special focus was given in 1988 concerning other elements of flood warning and response. With new data sources rapidly increasing, it is clear that efficient ways of managing the data are needed and that the communications aspect of flood warning deserves much more attention. Emergency managers and technical support personnel can become overwhelmed by the excessive amount of available data. This can lead to confusion and delays in making critical decisions. Communication methods must be improved by focusing on specific user needs. Confusing terms and unnecessary dialog need to be avoided by technical personnel when working with sheriff and police dispatchers. In addition to improving communications, it also became apparent that technical personnel involved with flood warning activities needed simplified procedures for recognizing serious situations. As a first step, small urban watersheds were targeted for developing such procedures. Critical rainfall thresholds capable of producing various types of flooding events were identified. Emphasis was placed on how to recognize flash flood potentials and maximize warning lead times. The ultimate goal in developing such criteria is for emergency managers to become more proactive in responding to urban flash floods as opposed to being forced into a reactive mode of operation. Due to the nature of flash floods on small urban streams, this concept presents a difficult challenge. The results of this year's efforts have been presented in a paper entitled: "Effecting Timely Responses to Urban Flash Floods" authored by Kevin Stewart. This paper was presented at two conferences this year, an ASCE conference at Colorado State University in Fort Collins and a National Weather Association meeting held in Denver. The paperdescribes the dilemma of evaluating and disseminating timely flash flood information and the importance of meterorological forecasts on a mesoscale level. 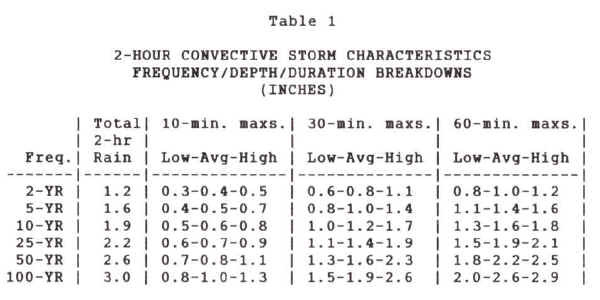 A simplified decision aide was developed for identifying critical rainfall thresholds (see Table 1). Table 1 can be used in two operational modes, the forecast mode and the observation mode. In the forecast mode relative flood magnitudes can be recognized on a preliminary basis. If an early outlook provides quantitative precipitation forecasts (QPF's) of smaller magnitudes (say less than 1inch), serious problems are not likely and projected flood conditions will be limited to streets, intersections, and other frequent nuisance areas. Forecasts of greater magnitudes would prompt different states of readiness and permit emergency resource planning to begin at an early stage. In order to effectively use the decision aide in a forecast mode, QPF's must be provided which specify total rainfall amounts, storm duration estimates, and probably peak intensities (e.g. 10-, 30- and 60minute periods). During the observation mode, data is collected and displayed in real-time by the ALERT base station. The same decision aide can be used to identify the occurring storm magnitude at any point where an ALERT gauge exists. The data received can be evaluated and extrapolated to other ungauged areas through the use of weather radar and satellite. By recognizing a storm's "signature" in terms of rainfall frequency, expected flood magnitudes can be predicted in realtime. For a given drainage basin and associated watercourse, flood arrival times can be estimated for various hydrologic forecast points and known problem areas using data from previous hydrologic modeling efforts or actual measured runoff events. Combining this knowledge with proper communications, people and equipment resources can be positioned to prevent possible loss- of-life and in some cases, prevent unnecessary property damage. The paper referenced in this article is available from the District upon request and contains the methodology used to develop the decision making procedures. The paper discusses meteorological forecasting requirements and provides an overview of how to do site specific forecasting by using an actual flood example. ALERT data management and electronic communications are also presented in the paper along with recommendations addressing the "cry wolf' syndrome and other critical aspects of urban flash flood warning programs. In 1989, the District plans to build on the concept presented in the Urban Flash Flood paper by developing similar procedures for large drainageways and in particular, the major mountain canyon streams affecting the District. In addition, the flash flood decision making process may be automated in 1989 by developing computer accessible text keyed to specific local jurisdictions and major drainageways. Training programs are also being developed to orient public safety officials to the flash flood prediction services being provided. Emphasis will be made on obtaining input from these public safety officials regarding their specific needs for effecting timely emergency responses. Since 1985, the Urban Drainage and Flood Control District has been using electronic mail to obtain hard copies of weather forecasts in conjunction with the District's Flash Flood Prediction Program. Through the 1987 flood season, these messages were relayed by Henz Kelly and Associates (HKA) to a dedicated computer (IBM PC-jr) located at District offices. The messages provided a daily synopsis of the flood potential for areas within the District. For this 3-year period, the HKA communication served to notify District staff of the possibility of a flood occurring later in the day. These messages were typically received a number of hours before standardized internal alert messages were issued to local public safety officials. In April of 1988, the electronic mail concept was expanded to begin exchanging weather forecasts with the National Weather Service on a routine basis and to make these messages available to the various contact points served by the program (i.e. sheriff's departments, police departments, fire departments, etc.). The District's ALERT Base Station provided the means for the Weather Bulletin Board service at minimal expense. Two phone lines and modems were added making a total of three lines available. The multi-tasking capabilities of the ALERT Base Station were ideal for developing customized access procedures. The Bulletin Board was established for communicating early outlooks and internal alert messages only. User access is restricted to public safety organizations within the District. The intent of the Bulletin Board is to serve the emergency management community by providing critical weather information before situations develop. This allows emergency managers to take early actions such as recognizing resource needs and positioning personnel and equipment well in advance of an actual emergency. This year, 181 weather messages were relayed by Henz Kelly and Associates through the Weather Bulletin Board. Primary users of the Bulletin Board included Boulder County, Denver, Aurora, Arvada, The Consolidated Mutual Water Company and the National Weather Service. Other public safety organizations were unable to access the Bulletin Board due to the lack of available computer facilities at their respective communication centers. These individual limitations and needs are being recognized and efforts will be made to accommodate all users involved with the District's Flash Flood Prediction Program. The response to the Bulletin Board service this year has been overwhelming. Processes are currently being refined to include National Weather Service special weather statements, urban flood statements, flash flood watches and warnings as available products through the District's Bulletin Board. These products are currently not available to many local emergency managers since very few organizations currently subscribe to NOAA Weather Wire. Through the winter season, procedures will be refined for the 1989 Bulletin Board service including standardized messages, dissemination times, customized products for more sophisticated users and specifications for user access restrictions. The District would appreciate any comments or recommendations regarding operational procedures for message dissemination. It is the District's desire to continue improving capabilities in this area, thereby, providing better flood prediction services to local emergency managers. In July of this year, a VISTA satellite downlink system became the latest asset in the District's Flash Flood Prediction Program. This system was purchased from Kavouras, Inc. of Minneapolis, Minnesota and provides for data ingest of multiple western satellite sectors. The imagery is a highresolution 64 level gray scale with data being transmitted every 30minutes in infra-red and visible pictures. The VISTA computer can store up to 24 hours of images which can be played back, a single frame at a time or at animation speeds ranging from one frame every five seconds to thirty frames per second. The VISTA can have up to five satellite sectors for animation. Numerous base maps are available with the largest scale being a 2-mile resolution map covering an approximate 4-state area. The infrared imagery can be colorized to highlight critical cloud top and ground surface temperatures. The VISTA system has proven to be a valuable asset in tracking storm systems, estimating arrival times, and providing data for longer range forecasting. Moisture sources and disturbances from the Pacific Ocean, the Gulf of Mexico and inland systems can be easily tracked with this satellite system. Cold fronts, lines of active thunderstorms, probable severe weather systems, and other features can be identified and used in conjunction with other available surface and upper air data to improve forecasting capabilities. Ground features such as the major river valleys and the Colorado front range are recognizable from the system's visible imagery. From this year's limited experience, it is anticipated that the VISTA satellite downlink system will continue to prove its value as future storms and floods inevitably occur.